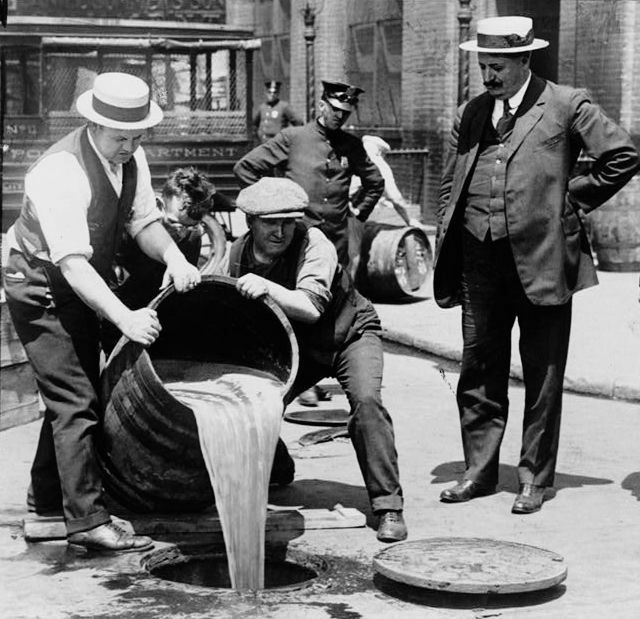 Congress enacted legislation called the National Prohibition Act, better known as the Volstead Act, It was vetoed by President Woodrow Wilson on October 27, 1919. Later that day, the veto was overridden by the House on October 27, 1919 (175–55) and by the Senate (65-20). It became law on October 28 and was one of the most disastrous Acts ever passed by Congress. to ensure an ample supply of alcohol and promote its use in scientific research and in the development of fuel, dye and other lawful industries and practices, such as religious rituals. It provided further that “no person shall manufacture, sell, barter, transport, import, export, deliver, or furnish any intoxicating liquor except as authorized by this act.” It did not specifically prohibit the use of intoxicating liquors. 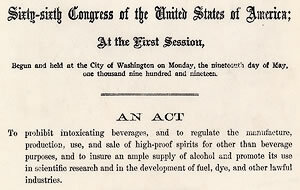 The act defined intoxicating liquor as any beverage containing more than 0.5% alcohol by volume and superseded all existing prohibition laws in effect in states that had such legislation. Section 29 of the Act allowed 200 gallons (the equivalent of about 1000 750 ml bottles) of “non-intoxicating cider and fruit juice” to be made each year at home. “Intoxicating” was defined as anything more than 0.5%, but the Bureau of Internal Revenue soon struck that down and this effectively legalized home wine-making. For beer, however, the 0.5% limit remained until 1933. The Act contained a number of exceptions and exemptions. Many of these were used to evade the law’s intended purpose. For example, the Act allowed a physician to prescribe whiskey for his patients, but limited the amount that could be prescribed. Subsequently, the House of Delegates of the American Medical Association voted to submit to Congress a bill to remove the limit on the amount of whiskey that could be prescribed and questioning the ability of a legislature to determine the therapeutic value of any substance. The Act called for trials for anyone charged with an alcohol-related offense, but juries often failed to convict their fellow citizens of a “crime” of which they were also guilty.